NEW RECIPE: There are lots of Mexican restaurants here in Southern California and I love Mexican food but I don’t always feel good after eating it. And tacos are my favorite so I decided to create something of my own that’s healthy, low fat, easy to serve, and really good! 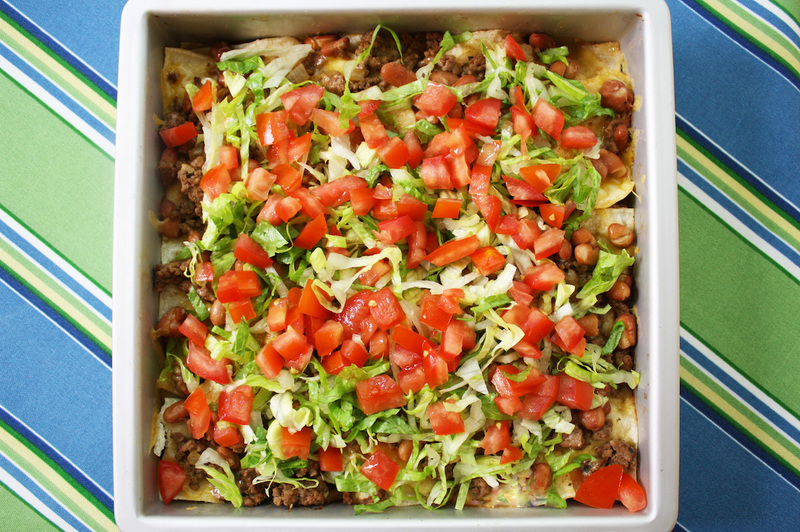 Most taco casseroles use tortillas chips but corn tortillas are a healthier choice and they make a taco casserole that’s soft and with more flavor than using tortilla chips. This easy dinner is high in fiber and protein. it has two vegetables, and it’s gluten free. Quality matters so look for corn tortillas with the shortest ingredient list and not too much salt. I always look for low sodium products including the pinto beans (I use S&W brand). You can always add salt later or even some cayenne pepper if you like it spicy. And do not use pre-shredded cheese because it won’t melt like freshly shredded cheese. And when drizzling the bean liquid be sure to get the edges. 3 Tortillas + Meat + Drained Beans + Bean Liquid + Cheese. Repeat this two more times to make 3 layers and then add remaining 3 tortillas on top. I like to tear and scatter them over the top in smaller pieces for easy serving. (It’s okay to have some openings in the tortilla layers). You can serve this taco casserole two ways: Either top it with the shredded lettuce and tomatoes or serve them on the side. It’s fun for everyone to put on as much as they want and you can even use some chopped white onion as an extra topping, or even some sliced jalapeno peppers. 10 Comments on "Quick & Easy Taco Casserole"
OMG Jenny!!!! I just saw this recipe! It is a must try but I can’t get past your Nachos! Yum!!! Yum!!! Thanks for the recipes! Thank you Jenny for another fabulous and delicious recipe. I absolutely love your cooking style. This recipe is a family favourite now. Great recipe! My kids had three helpings each! This looks like something we would really enjoy – all except the beans. Do you recommend something else in place of the liquid? Thanks! Hi, just saw your post. I have substituted beef broth. Works fine for me. I make Jenny’s turkey chili last night and I was amazed at how delicious it was. I had never used ground turkey before, but I didn’t even know it was turkey after I started eating it. Great recipe. Thanks Jenny! Confession: Last night I made some chicken stuffed bell peppers. I used pre-packaged shredded Mexican cheese. I only feel a little bit bad though because it was 5 kinds of cheese all in one handy bag. But I ususlly DO shred my own cheese. Oh, and BTW, you totally made a believer out of me on the correct way to measure flour. 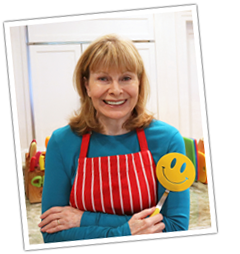 My cookies, brownies and cakes, etc all come out much better, thanks to you! Its so much fun to open my email up and find another delicious recipe. You have been a great blessing with meal prep. Very down to earth recipes with lots of compassion. Also love watching your utube recipe videos too. God bless you. Peace be with you. I will make this as my husband and I love soft tacos. I discover you about 3 weeks ago have made choc. cake, yellow cake and spare ribs, oh yeah forgot also made the granola. I am so pleased and your videos are so entertaining. Looking forward to making this recipe. Very helpful tips that seem essential to a successful run. Love that you add cumin; an essential spice in my Mexican recipes. Also, freshly shredded cheese does not include cellulose as does the pre-shredded, store-bought cheese. Who needs a wood product added to their meal?